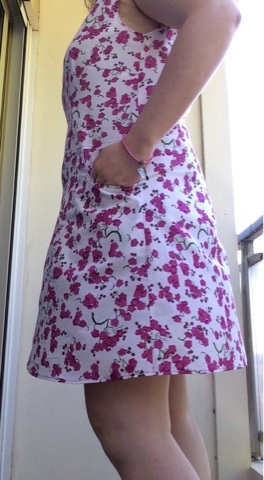 If you allow me, this post is going to be educational, since I am going to share with you a few lessons learnt in dressmaking [and other]. Maybe that’s too ambitious, so let’s just say it’s going to be at least a personal reminder. I wish I had a small sewing genie next to me, to advise my poor judgement when I choose patterns to sew. Everything seems good looking and appealing in theory, but then I don’t like some styles on me. I must recognise I have come a long way in ruling patterns before buying them, but sometimes I fail. This is the story of one of those failures: a tunic dress! This lovely pattern came in Love Sewing magazine (issue 13), and I liked it since I first saw it. 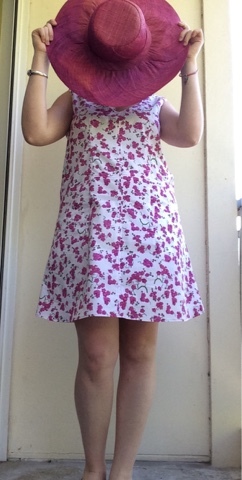 I liked the idea of a simple dress, with a couple of interesting details (pockets and topstitching), to wear without effort and like a blank canvas for styling. After sewing it, I haven’t changed my idea on all of that, but please, my good sewing genie, if you are there, please never ever ever ever let me invest my time in a tunic dress. Because then I would not like how it looks on me, and I will end up inventing so many modifications, that in the end I will lose time and the original pattern design. Even if you pick a super simple pattern, you have to invest a huge amount of patience to have a good result. Anyway, let’s talk a bit about all the modifications: I removed the sleeves and designed simple facings while changing the armholes shape to accommodate the lack of sleeves. Then, I lowered both the front and back necklines, trying to graciously harmonize them. Then accordingly modified the provided neckline facings. I also repositioned a bit the bust darts. After that, the dress construction was easy and pleasant, a part from a couple of things that didn’t match, but this might be my fault. And just when you think the dress is going to be finished in a little bit [and they are going to hire you], I tried it on: big drama, because I looked like a ghost wearing a white sheet on my head and floating around. I had made no toile, because how difficult can be a tunic dress? In the end, I added very long vertical front darts (if that’s a thing), very long vertical back darts (again, pure invention of mine) and removed a good 12 cm. (in total) from the side seams. The frustrating detail is that I proceeded little by little with these modifications, making them super long and sometimes boring with a lot of sew-over. Let’s say it was a thorough patience training. While enduring the long fitting session, the only thought that kept me going was the feel of this lovely fabric under my admittedly very nervous hands. It is a most enjoyable Japanese cotton lawn that I bought in the Cloth Shop of Remnant Kings during my last trip to Edinburgh a few weeks ago. It was a very good deal on price, and I originally bought it to be a button up shirt. Then I changed my mind and thought that a simple tunic dress would better showcase the lovely print. It does, and I am quite happy with the final result, even if the topstitching and the pockets are not super visible because of the busy print. Anyway, I like the idea that it looks plain from a distance but hides interesting details to a close look. 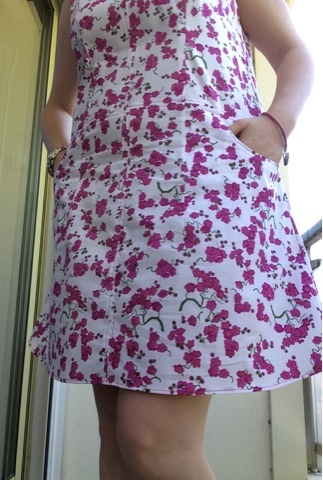 Also, thanks to the print I could better hide all the darts and adjustments I had to do later on.In conclusion: I have a new summer dress, I still have no job, and I hope you have learned a bit from my little experience.